We stayed at a lovely, modern Airbnb on Kleistgasse, near the Fasangasse tram stop (many street names end with the suffix -gasse, which can initially confuse travelers). The apartment was a beautiful duplex with a rooftop patio. I’d highly recommend an Airbnb with an outdoor space, as the natural light and the ability to look over the city was definitely the best part of the apartment. Also, having a kitchen is not only useful and economic, but I also really felt at home for the weekend. Plus, we spent much of the weekend exploring Baroque architecture and storied hotels, so it was really nice to come home to a sleek, contemporary apartment. We were located right by the Rennweg train station (which goes directly to and from the airport) as well as walking distance from the Belvedere museum and about a 30 minute walk from Ringstrasse (the city’s grand boulevard). It’s a great location to be near the city center without staying in the tourist-y quarters. Travel tip: do not take the lime green city airport train that is advertised the second you land in Vienna’s international airport, Flughafen Wien (VIE). It is a tourist trap, and not even any more convenient than just taking the metro into the city. A metro ticket from the airport to Vienna’s city center is less than 5 euros, compared to the 19 euro shuttle train ride. Because we were only in Vienna for a weekend, we had to be selective about what we wanted to see. 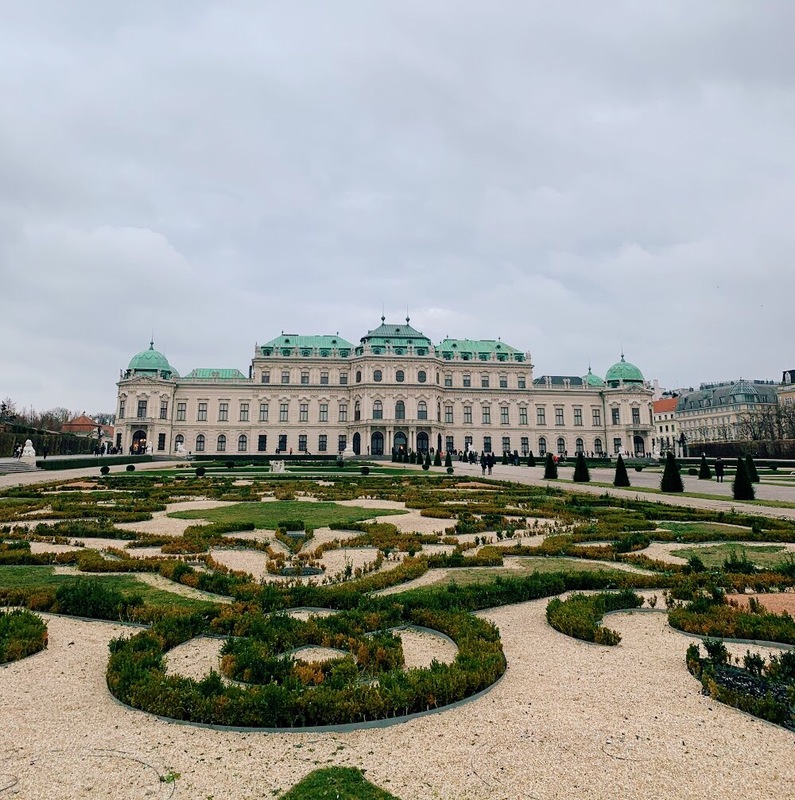 Our first choice was the Belvedere Palace and Museum. It is a historic building complex made up of two iconic baroque palaces. In between the palaces is a lush, meticulously landscaped park/garden. Lower Belvedere was built first, but Upper Belvedere is the more famous building, as it was one of the world’s first public museums. Today, the Upper Belvedere houses permanent art displays including Gustav Klimt’s The Kiss. The Lower Belvedere has free entry and allows you to access the gardens. If you’re in Vienna during the wintertime, you must go to a Christmas market. The Belvedere hosted its own Christmas market, so we didn’t have to walk far to happen upon it. Naschmarkt is another great option, as the most famous food market in the city, but it is unfortunately closed on Sundays, when we would have liked to go. Markets are a great place to try street foods, like the world-famous Viennese sausage, for example. Mulled wine is also a must-try during the wintertime. At the market, I tried a vegetarian option: Käsespätzle, egg noodle pasta with cheese, topped with crispy, caramelized onions. After lunch at the market, we took a cross-city walk to Ringstrasse, the city’s grand circular boulevard. Walking is a great way to explore the city’s architecture. We probably stopped every five minutes to take pictures of unique alleyways or interesting facades. Ringstrasse is a must-see, particularly because many of the city’s most important buildings reside here. Because it was the holiday season, the trees that lined the boulevard were illuminated with Christmas lights. There are also trams that travel up and down the road, and they are charmingly vintage. On our walk, we also saw the Parliament Building, Rathaus (city hall), and the Vienna State Opera House, an amazing neo-renaissance structure that featured modern outdoor sculpture. There is also a commercial district in this area, so we took an hour off from sight-seeing to explore clothing stores and do a little bit of shopping. Figlmuller- Classic Viennese restaurant, and one of the best-known schnitzels in the city. The interior is lovely, with cozy exposed brick and sturdy wooden tables—the perfect milieu between classic pub and chic restaurant. We of course ordered the schnitzels (we tried both the pork and veal versions. They are the size of your face, so we shared two meals between three people). The roasted potatoes and potato salad are also great. Should be accompanied by beer, of course. Café Sacher- The famed café of the namesake hotel is loved by locals and tourists for its claim as the home of the sachertorte: a super dense chocolate cake with a light apricot/citrus undertone, covered in a layer of dark chocolate and served with whipped cream. The perfect place for an afternoon snack, and the coffee and hot chocolate are also very good. We chose the dessert tasting menu. Expect to wait in line for a while before getting in. Restaurant Irodion- Classic Greek restaurant with hellenistic decorative touches. The specialties are the seafood and vegetable dishes. I had the fried eggplant and zucchini as a starter, and the salmon filet with spinach for dinner. There is also a very good wine list. Flex- Classic underground club and a great example of Viennese techno culture. The club was super dark and the music was all noise, no instruments. Overall, a different and exhilarating experience. Felixx Bar- Trendy gar bar with good cocktails and dancing downstairs. Sophisticated atmosphere with fun music. One weekend in Vienna is not enough. There are so many monuments, restaurants, and neighborhoods waiting to be seen. My one regret is that I did not get the chance to spend quality time in the city’s famed museums. However, the weekend was a great introduction to a city I will hopefully visit again in the future.